Fort Bragg Beach or simply Glass Beach is one of the weirdest shores on Earth. It is located in MacKerricher State Park, near the military base of Fort Bragg, California. 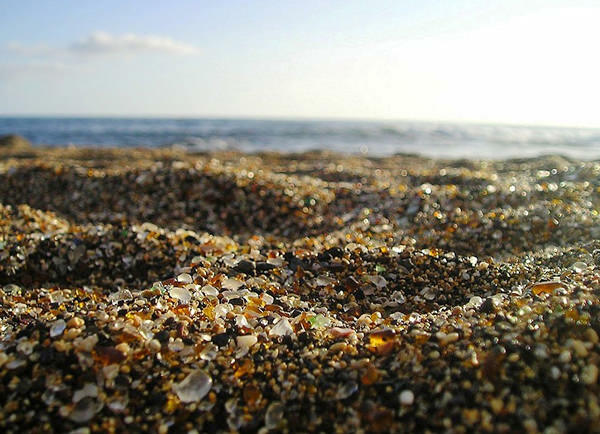 The beach is famous of the tiny glass pieces, that cover the whole shore area. These beautiful glass rocks have been formed by water and sand out of the waste. Do not get too excited: most beached were seriously polluted by dumping litter into the Ocean. However, this place is a pleasant exception. It took about 40 years to form this glassy beach. And it will from 500 to 1000 years until the nature will recycle this. However, now it is prohibited to pick glass pieces as souvenirs. The place is indeed unique, a natural work of art, a nature’s statement about ecology.